Necklaces There is 1 product. The necklaces are divided into 5 different collections which symbolise 5 different style. You will be able to customize your necklace by choosing among a wide range of colors and stones. 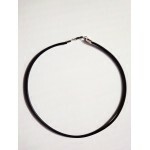 Here you have the possibility to buy just the choker or black lace : choose your size.